The on-going and future changes in the semiconductor industry will continue to make the devices more sensitive to ESD (Electrostatic Discharge) and, hence, a need for better and more efficient solution for eliminating or neutralizing static electricity. Mr. Glynn further discussed how “NRD’s alpha ionizers use very safe technology, do not need electricity to operate, and require no maintenance or calibration, as well as maintain inherently zero-volt balance even in nitrogen environments. Whereas, a corona ionizer requires high voltage to operate and is not always the best option in highly sensitive semiconductor processes." Alpha ionization is slowly becoming the static elimination solution of choice for many organizations due to its flexibility, reliability, lack of maintenance, and ability to perform in environments. NRD is the only company to offer advanced alpha ionization technology and has spent over 40 years perfecting safe, effective solutions that meet the demands of customers worldwide. NRD provides products uniquely designed to fit seamlessly into each work environment with the user’s safety, comfort, and production requirements in mind. Mr. Glynn concluded that “NRD has the best solutions that can address ESD-related issues in the semiconductor as well as many other industries". For over 40 years, NRD has been a global supplier of devices that eliminate electrostatic discharge in environments such as R&D, laboratory, technology, industrial applications, and automotive, as well as specialty sources for ECD, IMS, and more. They service each industry and static concern uniquely with a customer-first approach and are the only company in the world that offers both alpha and corona static control solutions. 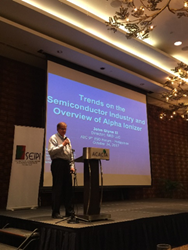 The Semiconductor and Electronics Industries in the Philippines Foundation, Inc. (SEIPI) is the largest organization of foreign and Filipino electronics companies in the Philippines. SEIPI, through its vision and dedication of its members, aims to make the Philippines a globally competitive business environment for semiconductor and electronics technologies. This is supported by its mission of enhancing and promoting the Philippines’ competitive advantages and growth opportunities through Training, Research and Development, Advocacy, Information, Networking and Services (T.R.A.I.N.S. ).